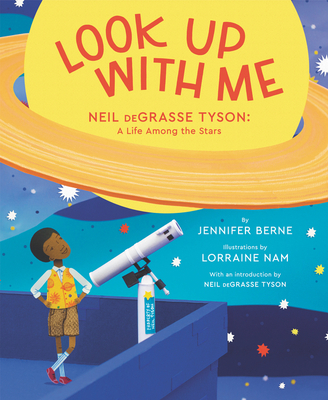 With an introduction from Neil DeGrasse Tyson about the importance of kid-like curiosity, this lyrical picture book biography on the beloved astrophysicist and host of Cosmos is the perfect gift for young astronomers and fans of all ages. Neil deGrasse Tyson was born curious. And the secrets of a billion galaxies lay there—waiting for him to explore its cosmic mysteries. He just had to look up. Up beyond the city lights, up at the shining stars, up through the Milky Way, and past the veil of the night sky. Follow young Neil's journey as he discovers the wonders of space, the thrill of science, and the joy in sharing the beauty of our amazing universe. Read his favorite mind-blowing facts and learn what mysteries are left to solve. From On a Beam of Light author Jennifer Berne and debut paper illustrator Lorraine Nam comes the inspiring true tale of Neil's life and how he became a world-famous astrophysicist. The future of discovery lays with you. Look up with Neil and begin your own journey into the cosmos. Jennifer Berne is the award-winning author of On a Beam of Light: A Story of Albert Einstein and Manfish: A Story of Jacques Cousteau. She grew up in New York City, spending days at the zoos, museums, and the planetarium. At night, she had a little globe that projected stars on her bedroom ceiling. After a successful advertising career, Jennifer began writing for Nick Jr. magazine and writing books about the subjects she loves most—our amazing universe and the people who discover its secrets. She lives in the beautiful rolling hills of Columbia County, New York, in a house she designed herself. You can visit her online at www.jenniferberne.com. Lorraine Nam is a paper illustrator and daydreamer. When she is not folding, gluing, and cutting things out of paper, she can be found cooking, reading, or traveling. She currently lives in Brooklyn, New York, and frequently looks out at the New York skyline from her studio window. In a clear night sky, she is able to see the occasional star. You can visit her online at www.lorrainenam.com.